Although honeybees work hard to feed their colonies, supplementation can help them survive periods of stress and famine. Bees gather nectar and pollen from blossoming flowers and trees. During the summer months, your bees experience an abundance of this natural source of food and energy. 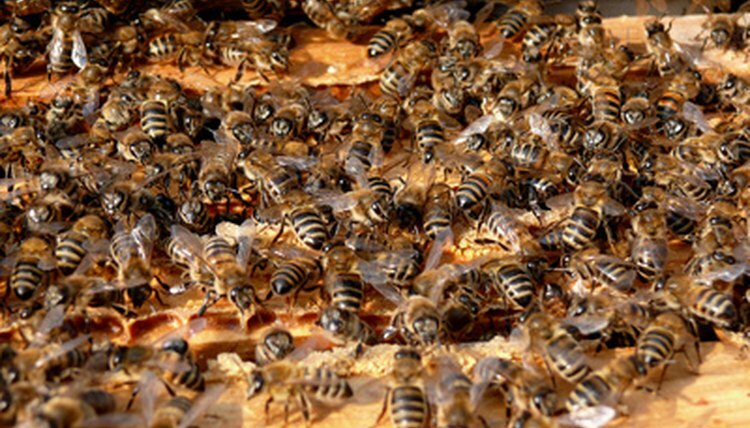 Your bees produce honey for storage, as well as current use. However, if you harvest their stores of food for your own use, or if you live in an area with harsh winters, your bees may require supplemental feedings. Although beekeepers often purchase prepared bee food, making your own food provides an inexpensive alternative. Measure 4 cups of warm water into a 2 to 4-quart cooking pot. Add 15 pounds of granulated sugar to your water. Stir the water and sugar together with a large, wooden spoon. Add 3 pounds of corn syrup and ½ teaspoon of cream of tartar to your sugar water. Place your pot over low to medium heat on your stove’s burner. Heat slowly, stirring often to help the sugar dissolve and mix into the water. Check the temperature of the heating mixture frequently, allowing it to heat until it reaches 240 degrees Fahrenheit. Turn off your burner and remove your pan from the burner, once your thermometer registers the correct temperature. Allow the mixture to cool until it reaches about 180 degrees Fahrenheit. Beat your mixture until it becomes thick and hard to stir. This may take about 2 to 3 minutes. Scoop your thickened mixture onto a cookie sheet covered with waxed paper. Spread the mixture out with your wooden spoon, keeping it thinner than the depth of the top frames on your beehives. This may vary, depending on the construction of your individual hives, but generally measures between 1 and 2 inches deep. Allow the bee food to cool and harden on the paper. Once cooled, peel the wax paper from the back of your bee food. Break the bee food into smaller sections, measuring about 4 inches by 4 inches. Wrap the individual squares in clear plastic wrap and place in your freezer until ready to feed to your bees. Place your bee food over the tops of your hive frames in late February or early March. Feeding your bees at this time will stimulate brood production and help keep them healthy until nectar begins flowing in the spring.